This album contains pulsating bases of club anthems and social messages in revolutionary hip hop & R&B tracks. 9. This Is the Way We Do It! On January 15, 2008 Jam G. Records will release Just (Because) from producer, writer, musician Jam G. Just (Because) is a blend of today's contemporary hip hop, soul and rap that may establish a new direction for hip hop music! You can go to www.jamgproductions.com for all the latest Jam G. info and CD ordering. 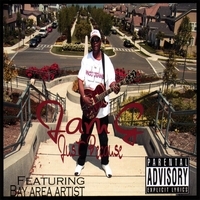 James "JR" Tall aka Jam G., a longtime Bay Area guitarist says "the world needs this kind of music" is the genesis for this exceptional 12 tune CD. A Chicago native Jam G. remembers the music of Aretha Franklin, Donny Hathaway, the Isley Brothers and later George Clinton and Prince as well as his grandfather a banjo player and his mother a gospel singer as being the spark that ignited the fire of music that became his life. With inspiration as rich and diverse as those it's no wonder Just (Because) is such a dynamic, soulful and contemporary mix of music loaded with the San Francisco Bay area's best artists in supporting roles! If innovative, contemporary music is your thing, you'll love Jam. G.'s new funk track That P-Funk Thing, the pulsating bass of the club anthem Let's Party Tonight and the social message in the revolutionary rap/hip hop track Just (Because). Get ready to join the music work of Jam G.
RadioIndy is proud to present Jam'g a GrIndie Award for their CD "Jam'g Just Because." A GrIndie Award is RadioIndy's stamp of approval that this CD is an excellent quality CD. Please join us in congratulating this artist on this accomplishment. “Just (Because)” by Jam G is a vibrant CD saturated with musical surprises and talented guest artists. The excellent production quality and a superb mix of live instruments and creative digital beats give it a clean sound. The beats themselves are not merely loops but a smooth and creative compilation of various instruments, musical styles, and unexpected twists and turns. Both fans of rap and of R&B will be pleased with what they hear on “Just (Because)” as tracks like “See You at the Lake” are laced with strong rap flows by a variety of Bay Area artists. On the other hand, R&B fanatics will love tracks like “Let’s Party Tonight” and “Caution,” both completely R&B and wired to make you move. “Be 4 U Go” slows it down a bit for those who like their R&B with a little bit of soul. A compilation of everything urban, “Just (Because)” has something for everyone to move to.